After two remarkable EPs in 2012 and 2013 respectively, the latter released by Pariah Child, it was a long wait for that elusive full-length album. Little did we know that it would serve as their first and last. Looking back now, it is difficult not to read too much into the melancholic atmosphere that permeates much of the material. The earlier bounce now often a bleaker plod. Even Van Guilder’s vocal delivery seems somehow sadder, understated, as if sensing the end was only steps away. But be thankful that they did persevere through the doom and gloom. The band was not done until they accomplished what they wanted to achieve. 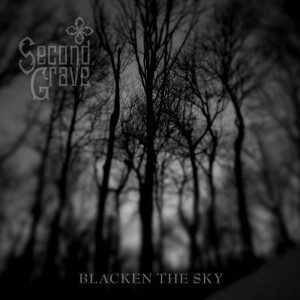 The shape of “Blacken The Sky” is intriguing. Careful consideration had been given to their first EP and that grasp of flow is perceivable again here. Nine songs and their duration of fifty-five minutes would sit well over three balanced sides of vinyl. Each of the three triplets founded on an eight to eleven minute opus. Album opener, “No Roam” begins with that bleak plod and poignant lead guitar before a pained narrative sings about displacement. Nomadic peoples, personal flight or a band in crisis. Take your pick. “17 Days” and “Below the Seas” are shorter yet still significant in length and riffing strength. The former loaded with claustrophobia, perhaps echoing a natural disaster, with a beautiful reprise in the eye of that particular storm. The latter defined by a deep rhythmic pulse, pounding drums and chugging riffs with some damn fine guitar volleys. In the second trilogy, “Afraid of the Dark” is most akin to old favourites like “Mountains of Madness” with that gradual build and hefty bounce coming to the fore. Whether it was written earlier than the bulk of the other new compositions or simply mined into that classic craft is uncertain. But the marriage of dynamics and commanding vocal delivery throughout is a joy to behold. Classic Second Grave. At the very heart, “Bloodletting” witnesses a harsh shift in sentiment. Frustrations boiling over. The chorus screaming for a purge. When it’s done and relationships are undone, the brief acoustic interlude, “Processional of Lies” feels like a release. Twice we hear the guitarist breathing in deeply and at the end, exhaling with equal gusto. Relief. Moving into the third and final triplet, “Death March” carries a changed air. No return. But neither fatalist nor wallowing. Pensive, it proceeds. The theme, a willing human sacrifice. Metaphor, I think not. Ironically, it may just be the masterstroke of the record. Epic through and through, with another heartfelt performance by Van Guilder and layers of lead guitar spiralling towards the heavens. Life force utterly spent. The subsequent ambient passage “Into Oblivion” is brief and transitory rather than wholly peaceful. The ultimate reprise comes in the stripped back title track. Plucked electric guitar underpins a lonely lament. Beautiful. Crisp. Clear. “Blacken The Sky” is accepting. Stark. Final.